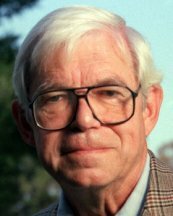 Charles Champlin was a writer-correspondent for Time and Life magazines from 1948-1965, Arts Editor for the Los Angeles Times from 1965-1991, and the principal film critic for the Los Angeles Times from 1967-1980. He was the author of Back There Where the Past Was: A Memoir (Syracuse University Press), George Lucas: The Creative Impulse (Abrams), Hollywood's Revolutionary Decade (John Daniel & Co.) and My Friend, You Are Legally Blind: A Writer's Struggle with Macular Degeneration (John Daniel & Co.) Mr. Champlin died on November 16, 2014. Mr. Champlin's wife was a librarian who had worked here at Cal State LA, so Mr. Champlin had a connection to our campus and the library. In the Fall of 2001, the library was putting the final touches on a new media center/collection. The University Librarian at that time (Mr. Doug Davis) and Media Librarian (Scott Breivold) asked Mr. Champlin if he would create a list of his Top 100 films as a way of launching the new media center and collections. I was asked by Doug Davis, the University Librarian of Cal State Los Angeles, to prepare my list of what I regard as the hundred best American movies of the sound era as a kind of core collection for the Library's new Media Center, and, all innocence, I said I would do it. I realized quickly enough that making such a list is fraught with chagrin, guilt and a wracking indecision. For every film I chose there were probably upwards of fifty more I could have chosen. After great and somber thought I came up with a rough list of two hundred. From there on down it was a slow and torturous process of reluctant reduction. What I also came to see quickly enough was that making such a list is as personal as the responses to a Rorschach test, as individual as a smudged thumbprint. I admit fully that the list is mine and mine alone. It reveals, quite as distinctly as a consideration of all my reviews, just where I stand. No one else could have made this list; probably no one else would have wanted to. What I had to ask myself was what the basis of my choices was. Not, I think, simply a popularity contest. Some of my choices were box office hits, some were distinctly not. But all have endured the test of time and favoring opinion. Looking at the list as a whole I see that the choices reflect the American experience as it has evolved over the years from, for example, "The Grapes of Wrath" forward. Naturally it reflects as well the evolution of American movies from the straight forward storytelling of the 30s to the more subtle films of the postwar era with their handling of moral choices and the complexities of present life. It is a very personal list. I am in my deepest nature an optimist and I have an admitted preference for films that can see the light at the end of the tunnel however dim it may be. I have no trouble acknowledging that violence is a part of life but I have had no appetite for films in which the violence struck me as exploitive rather than organic. I find quite a number of pretty funny films on the list and I think that those choices also reflect something about me. I would rather laugh than groan. The only thing certain about this list or any such list is that it will be disagreed with item by item with reactions varying from mild demurs to massive outrage. Compounding my felony of anointing a chosen hundred I found myself selecting the ten best. This will guarantee even stronger cries of outrage. How, for example, can "Gone With the Wind" be in the bottom of the Top Ten. It usually fares no worse than the top third. It is undoubtedly an icon among American films, but if you have seen it recently you might agree that it creaks and slows in its latter reels and it is very much a film of its time. To sum up, I think that the films I have held closest to my heart both as an ordinary filmgoer and as a working film critic are those that have come to grips with the changing society in which they arise and with human dilemmas, confrontations and resolutions that resonate most strongly with audiences. I rest my case, and run for cover.